This presidential election is prompting some of the most outrageous displays of support that we've ever seen before. In covering the entire state of New Hampshire, reporter Katherine Underwood and photographer Nik Saragosa spend a lot of time on the road. They admit they see political signs everywhere, but this election cycle, they've seen elaborate displays from Trump supporters. They have not seen the same from Clinton supporters. So they set out to figure out why. "I am just really sick of Hillary and the lies and deceitfulness," said Bedford resident and Trump supporter Mike Miller. Whether they like it or not, Miller's neighbors know exactly how he feels. "We decided we would build a prison and put her in it," he said, referring to the life-like Clinton doll inside metal bars on his roof. He's also got a replica wall in his front yard that his candidate promises to build. "It's 22 feet high, 16 feet long," Miller explained. "For Trump supporters, we need to get the message out." And Miller's not the only Trump supporter getting creative. There's a metal sculpture in Tilton, New Hampshire, a tractor-trailer-sized sign in Maine, and an oversized Trump face in Hampstead, New Hampshire. "These are people who are so sick and tired of status quo they are motivated beyond the norms of what we have seen in politics before," said political analyst Scott Spradling. Spradling says you won't see the same on the other side. "The Clinton supporters are far closer to the establishment and more traditional in their campaigning methods," Spradling said. 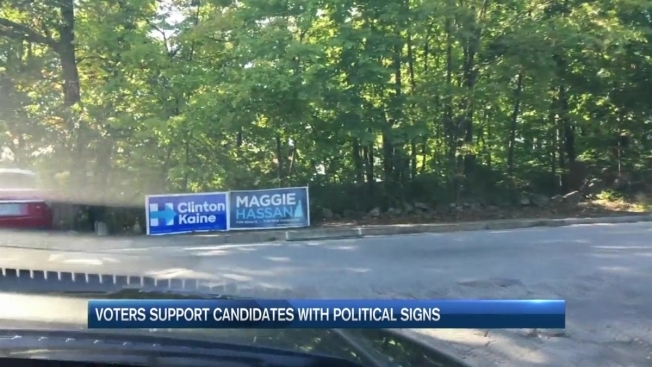 So traditional, when our necn crew hit the streets of southern New Hampshire, they couldn't find anything out of the ordinary from Clinton supporters. "We're driving around a heavily Democratic neighborhood in the state's largest city," Katherine said in a cell phone video taken Wednesday. "We've seen a lot of signs, but nothing more elaborate than this." She was referring to a giant Hillary sign outside Bill Gillett's home in Manchester. "I think it starts at the top, starts with the candidates, with the tenor of the campaign," Gillett said. When asked whether Trump supporters were more enthusiastic that Clinton supporters, Gillett said, "I don't think they are, I think they are manifesting their enthusiasm in a different way, in a way that I am not sure is entirely healthy." Back in Bedford, Miller admits he's angry at the establishment. "I've never done anything like this in my life," Miller said. But that anger, Spradling says, could prove detrimental at the polls. "Right now, history says if the majority of your support is because they want to vote against the other person, more of those people stay home," Spradling said. Miller tells necn no matter how the election turns out, he will feel successful knowing that his elaborate Trump display started a dialogue that some people may not have had otherwise.